Tick checkbox if you want to receive newsletters. Tick this checkbox if you 'do not' wish to receive newsletters. It is usually accompanied by a much longer label, catering to the general theory that users will not read the whole thing and just make a decision based on previous experiences with this type of interaction. Up until a few months ago, I did the same. I would just assume it says 'Tick this checkbox if you DO want'. Now I have to make sure I read it when signing up for anything. I personally see this as a very naughty, underhanded tactic of adding people to your mailing list, and it causes me to feel mistrust and disdain for the company employing it. Why do they do this - is there any other reason apart from trickery? Doesn't it cause mistrust when users realise or when they receive an email when they clearly thought they said "No, I don't want it"? Why go against the long established and widely understood interaction? This is a more honest implementation of this concept, by underlining not they have made it slightly more clear, but I assure you there are other sites who make no effort to distinguish it, where the only way of knowing is by reading all three lines to find the plain, unhighlighted 'not'. Yes - underhanded, but this is not a problem reserved for the web - it's long been an issue for print too. A couple of years ago, the EU banned pre-ticked boxes on shopping websites in order to prevent such issues as unintentional purchase of insurance or optional extras when purchasing plane tickets, for example. Let's face it, if the business model of a website involves income received from junk mail, selling on of email addresses, and other such schemes, they will have little compunction in slightly misleading messaging or using opt-out vs opt-in logic - until more legislation is forthcoming - at which point they will find another way. One area where I see opt-outs occurring frequently is with charity websites where indeed there is a very strong need to increase communication with people by email or by post in order to raise and retain awareness - and of course, seek donations. 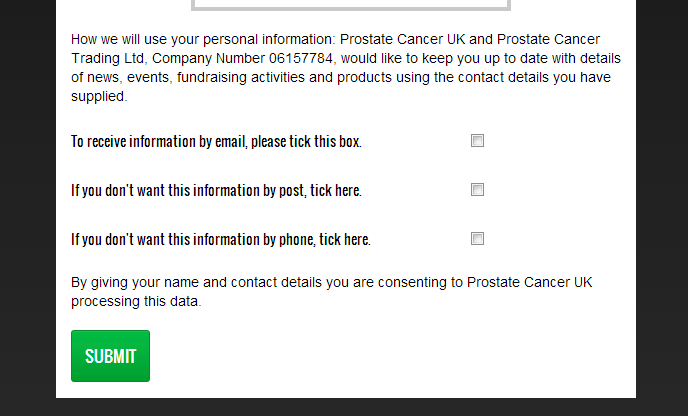 As you can see with the form below from the Prostate Cancer UK charity, they use a common tactic of mixing opt-ins (for email) and opt-outs (for post and telephone). Is this more acceptable just because it's a charity? Well consciously maybe, but in reality, no. Is it any less annoying to get 'unexpected' email and post from a charity. No. In fact possibly more annoying because I didn't mean to ask for it and I see it as a waste of money that could be better spent elsewhere. Underhanded tactics most likely often take part. But you can also regard it in matters of how you design the offer and the box ticking experience. Are you adapting the webpage to a ready made, one-fits-all offer, with made choices by what the organisation thinks you should have, and you can make changes to that ready made offer if you must? And otherwise just press "Confirm" without reading it all. Or are you giving a skeleton offer, where users will have to go through the settings to tailor their own orders, each time. Tick Checkboxes for changes. All are unticked as default. Untick Checkboxes for changes. All are ticked as default. Checkboxes matches the "ready made" offer. Some checkboxes are ticked, and some are not, matching what the organisation suggest that you order. Checkbox texts are easily readable, and ticks' default depend on both the offer design and the language. Now combine the different types of offers and tick or untick designs, and the NOT will be needed in the checkbox text. Typically combining 1. Ready made offer, with 1. Tick Checkboxes for changes, where you decide to opt out from a part of the deal. There are also other approaches than the ones I listed here, and there are certainly a lot of forms out there that are not using any recognizable design at all. It may be just me, but I personally often prefer it when checkboxes are unchecked by default. Then, once something is checked, it's a choice of my own rather than of someone else. The check box is right next to the field where you write your email address, so practically impossible to miss in that context. The label strongly emphasizes that it's an active opt-out choice. I basically figure that you need to go through the form anyway; what's frustrating is when the meaning of the choices is actively concealed or confusing. Don't make me have to think to get the outcome I want; whether that means checking or unchecking a checkbox is of lesser importance. Assuming that the organization behind the web site is reputable, they should respect your choice whichever one you make, but that doesn't mean they can't try to make it difficult to make the choice they don't want you to make; here, clarity helps the user as well as setting expectations for ease of later opt-out. Not the answer you're looking for? Browse other questions tagged forms registration checkboxes options dark-patterns or ask your own question.